EA Canada appears to be gearing up for development of an open-world next-gen Star Wars title, with some help from Visceral Games. A series of job postings across multiple EA studios seem to indicate that the publisher is developing a next-gen, open-world Star Wars game. If that's true, and if it's done well, EA may as well start printing money - but right now that information comes from a number of connected dots, with no official word from the publisher. Still, the evidence is there, and even the unconfirmed rumors are enough to wind up any Star Wars fan. EA Canada currently has an open position for an Animation Director, set to work on an unnamed Star Wars title: specifically, to "help define and deliver on the vision for a major new next gen open world action game." Ordinarily that would settle it, but there are a few other wrinkles worth noting. It takes a lot of work to build a next-gen open world action game, and Kotaku notes that EA Canada has done some downsizing lately - possibly leaving the studio with too small a work force to handle this project on its own. Meanwhile, the EA-owned Visceral Games is also working on its own unnamed Star Wars project - and incidentally, the Animation Director position asks for experience with multi-site development. Putting all this together, there are a couple of possibilities. It looks like an open-world Stars Wars game is coming, either from EA Canada or Visceral, or both. 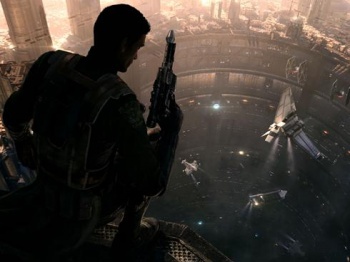 That in itself would be pretty cool; the closest we've come to that kind of game was the ill-fated Star Wars 1313. Then again, until we hear from official sources, this is all rumor and hearsay, and we might be on a wild womp rat chase.